In this last exercise before the main assignment, we are asked to take a series of photographs for one or two locations that we can visit at various tines of the day.I was in Wales recently staying with family so I decided tot are shots from morning till late in the evening for the front lounge area, from the same location within the room. For this first image we can see the morning sunlight just about to break through the front lounge of this cottage house. The lack of deep shadows means as the sun has not yet risen the light is very much diffused giving an overall soft light. This second picture is seen taken mid morning as the sun has risen high from the mountains over the Welsh border. 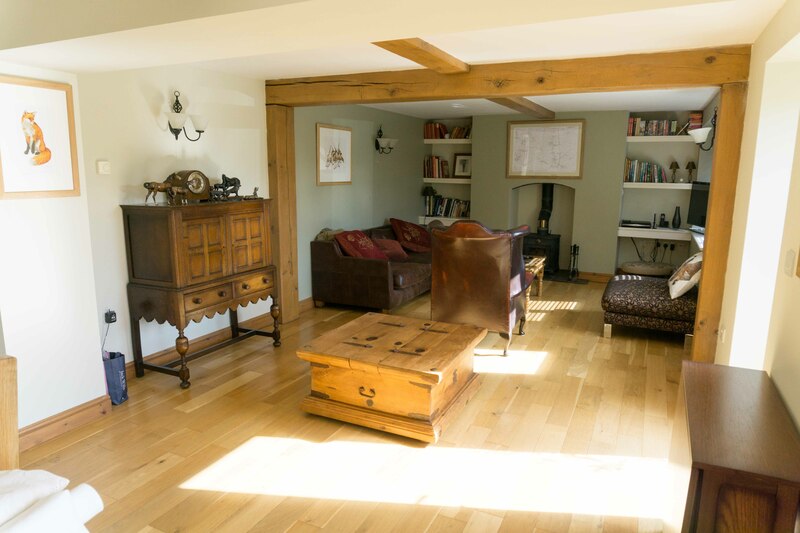 You can see the bright sunlight coming in very strong from the front door area, along with a second smaller window just out of view in the background lighting up one of the leather chairs. I did no heavy editing to the image so to show the bright highlights on the floor mostly as the eye saw the image. Taken just after lunch time the light from the windows has now moved further west and harsh light has now gone, with a very slight diffused light starting to form on the wooden floor area. The camera is now able to pick up more shadow in the background towards the fire place. This final shot is taken after the sun has gone down and we are left with artificial light to show the room without the need for a long exposure. AS can be seen no sunlight is coming through the door on the right side of the frame as before. The room looks a lot colder now we only have artificial light, with heavy highlights around the wall lights and deep shadows under and around the furniture. This was a fairly easy exercise to complete than i first expected, even though I had to pick my timings over when it was best to take shots of the room while it remained empty. I left the camera pretty much in the same location and angle for the shots to make the comparisons easier. I would like to do this again given the opportunity with outside buildings and possibly include moving objects such as cars and/or people. The task for this exercise is to choose from two or three buildings designed for a particular activity, and attempt to capture the area from the users point of view. This could be with the use of focal length and various viewpoints, either low or from a different angle. This image is taken from the inside of a University. The close crop to the left makes the viewer wonder where the stairs lead to, and what may lay behind the archway. I waited for some time for a person to walk down or up the stairs but no-one came through. The image was converted to B&W to bring out the strong lines and shades only B&W can show. 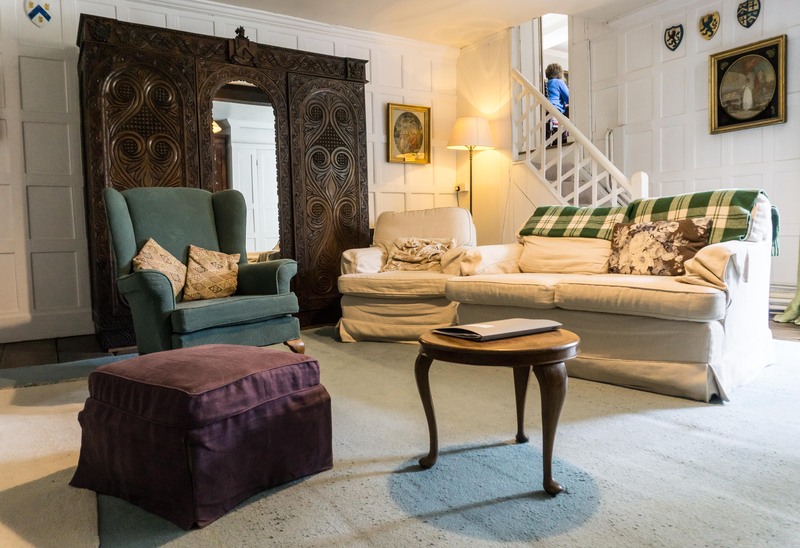 At first glance this image may seen like any normal front living room, but after a closer look the first thing that appears different is the furniture and decor is old. As the eye leads up the stairs we can see a person sat on a chair. Is the owner of the house, apartment, or a guest? The low viewpoint helps the eye scan into the image and then up the stairway. This si in fact a museum situated on the Wales, England border. I had to wait for some time for other visitors to leave the room so I could get a clear shot. However I couldn’t do anything about the lady on top of the stairs, but later thought this would make an interesting addition to the shot. A normal stairway? Maybe not. We can see the pictures on the wall are very old and in fact are antique. Taken in the same museum home as the previous photo, this is a stairway leading up to the main bedrooms. 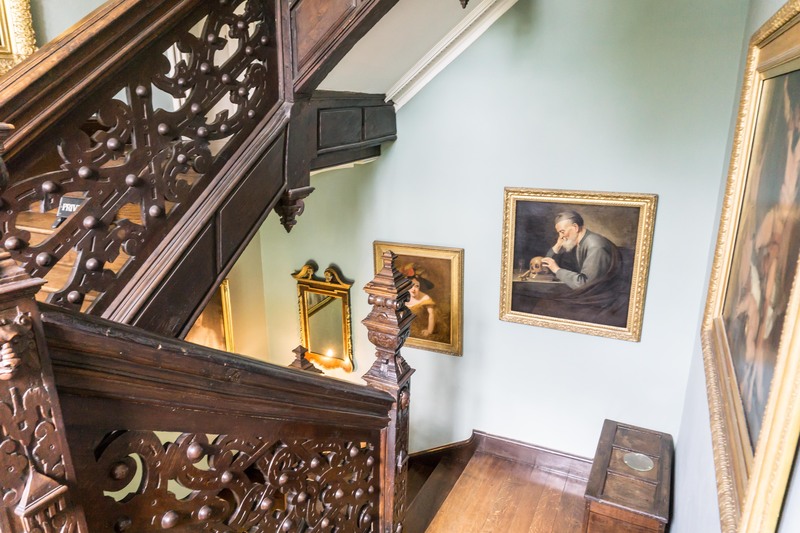 The old wooden carved banister leads the eye down the stairs while taking in the large pictures of what seem to be family members of the household from time gone by. Where do the stairs lead down to, and what is on the next level leading up to the left side? An old wooden chest on the stairway makes you wonder what may lay inside and what treasures maybe hidden, if any. Again I had to wait some time for the stairs to become clear of foot traffic. I found a high viewpoint looking down the stairs worked better than standing at the bottom looking upwards. This is a stairway taken in a small village in Wales, which is a residence area into a set of apartments and houses. The bright red stairs leads the eye up into a series of doors, with each set of stairs taking the person to separate levels. 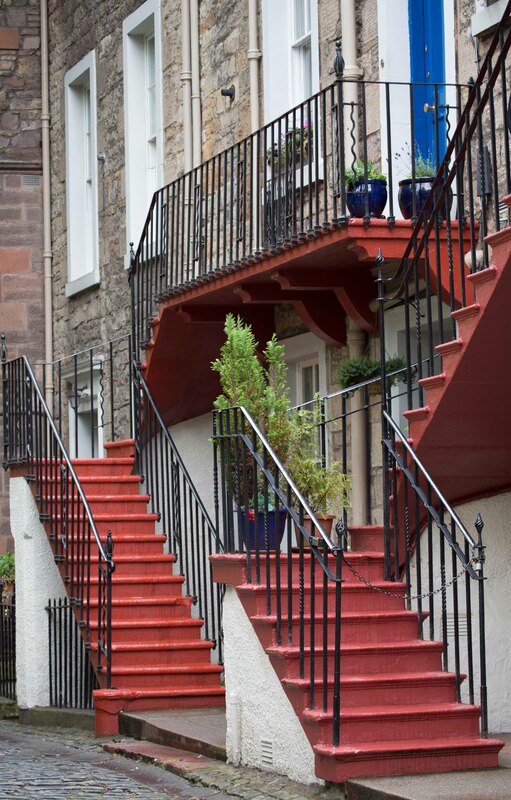 I like the colours of the red stairs and blue door which seem to compliment each other, and the large red balcony on the top seems to balance the red stairs on each side of the frame. I thought of taking this shot from front on, but I liked the lines of the steps from this angle better than a flat shot. A low shot would have made the converging verticals too severe so I remained at eye level for this one. This shot taken in a gallery shows a lot of negative space, which leads the eye to the person situated in the background of the frame. The eyes are helped into the frame with the wood grain of the floor, which brings the eyes onto each statue piece and then finally onto the framed pictures on the wall. 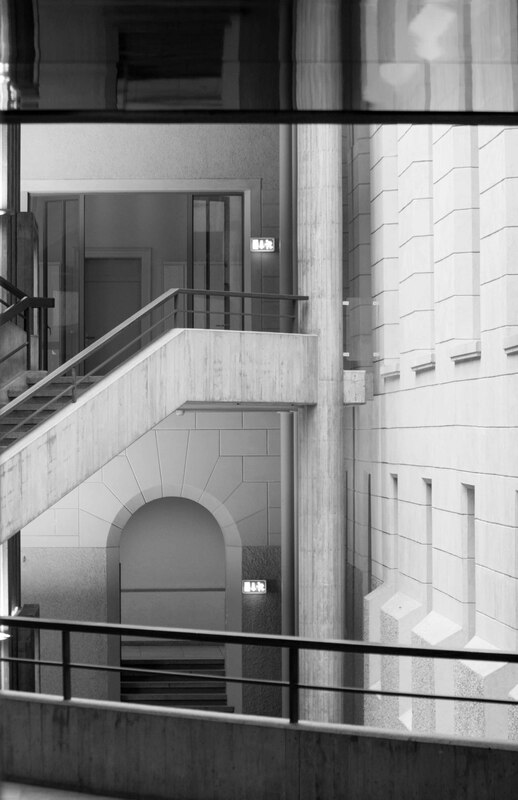 I would have liked the person in the shot to be not so central, but the figures in the picture on the left of the wall help the viewer to look back in to the frame as they seem to be looking at the person walking. 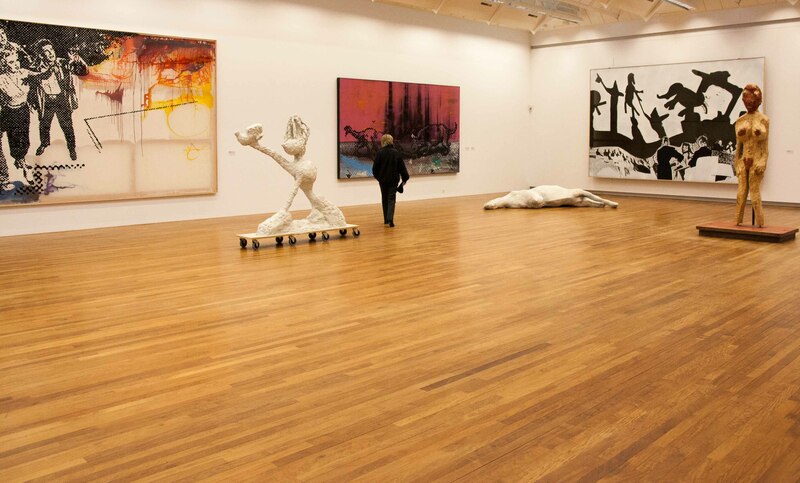 One wonders what the central statue piece is on the floor, is was in fact a figure of a dead horse. Taken in some office buildings, I waited for my friend to walk by while I placed the camera in a low position on the floor. I didn’t have a camera with a tilt up screen as I was using a Canon 5DMK3, so I set the camera to what I hoped would be a medium DOP at F11 in the hope it wouldn’t focus on the floor nearest the camera. 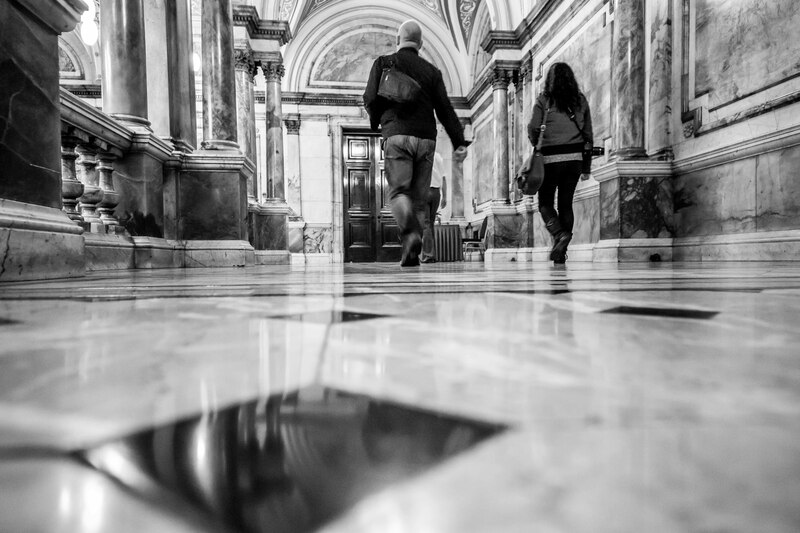 I took a few shots as the two people walked by towards the doors ahead. I positioned the camera so the black squares on the floor would lead towards the figures walking. An interesting exercise and at times found the viewpoints hard to decide on. I was sometimes unsure if I would be able to take images of something that was situated outdoors, such as the shot of the red stairs, but after looking at some other students images this seemed to be acceptable. “This exercise will help teach, first, a way of approaching a space and thinking about it that focuses on how it was intended to be used and whether or not its design was successful, and second, translating this thought process into an image. Choose any interior space, either domestic or public, and consider it from the point of view of its function. Who uses it or will use it? What is it intended to be used for? And how many different aspects are there to that activity? You are analysing the purpose of the room/space, and the process of doing this is the same for a dining room as for a more complex large area such as a public library. First note what you think the space ought to be doing — a short list. Then consider how well you think it succeeds. This is all before attempting photography, and it hinges on your own, personal point of view. Forming a point of view is important, because it will influence how you decide to photograph the space. Having made your analysis, make a carefully considered photograph of the space in order to put across the way it works — or should work — for the people who use it. If you are uncertain as to how best to do this, don’t be overly concerned. The rest of this section will help you to consider different techniques of approach and composition”. For this first exercise in the new assignment called Building and Spaces, I used a room as the given example above which I have in my home. 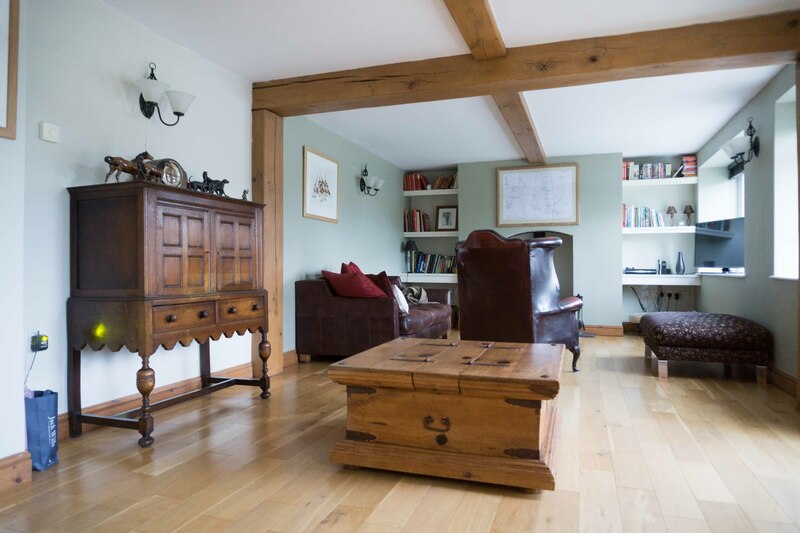 The room in question is actually not a room that one would use for anything in particular, but an open space on top of the landing which splits into each of the three bedrooms. 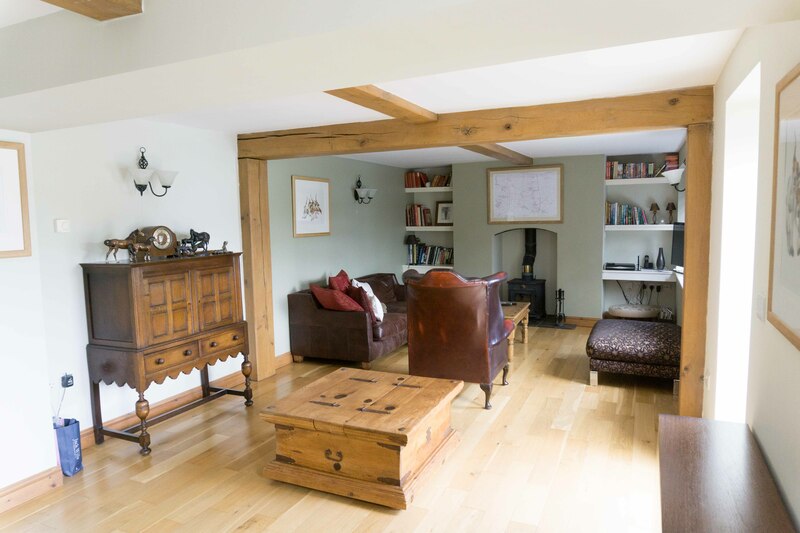 When we looked at the house to buy we liked the idea of this open area, and thought at the time it would make a good area for an office, without the need to take up a bedroom. The open area can be seen to be used as an office by the computer desk and chair. it could be mistaken for an office within an office block at first, but the brown doorway which leads to a bathroom and the chest of draws (which is for sale and there temporarily) give it away as to been a home location. The area could be used with nothing more than a few pictures or standing home pieces to fill in the area, or it could be an ideal area for a play area for young children, or a gym or exercise area. The large windows add ambient light make it an ideal area for study, writing or other studies. The blinds can be closed when using the computer for editing photos and video if required. The bookshelves add to the office feel, and the guitar in the corner suggestions an area for some recreation also when not at work. The fact no pictures are on the wall could mean this is a fairly ew new area to move into, with no time to date to place any hangings on the wall. In image 175 another doorway to a bedroom can be seen. The reason we can see two chairs on the floor is we had two computers, and one was sold. This suggests the desk was shared at some point. The fact no books are on the shelfs to the right again means this could be a new location, or the area is in the middle of being cleared and moving out, or new books to be purchased and the bookcase is new. The fact is we are selling the book cases so all books have been taken off and relocated to the new bookcase on the left. I was wondering what space I would take for this exercise that would be easy to work with, but would be interesting enough to ask questions. 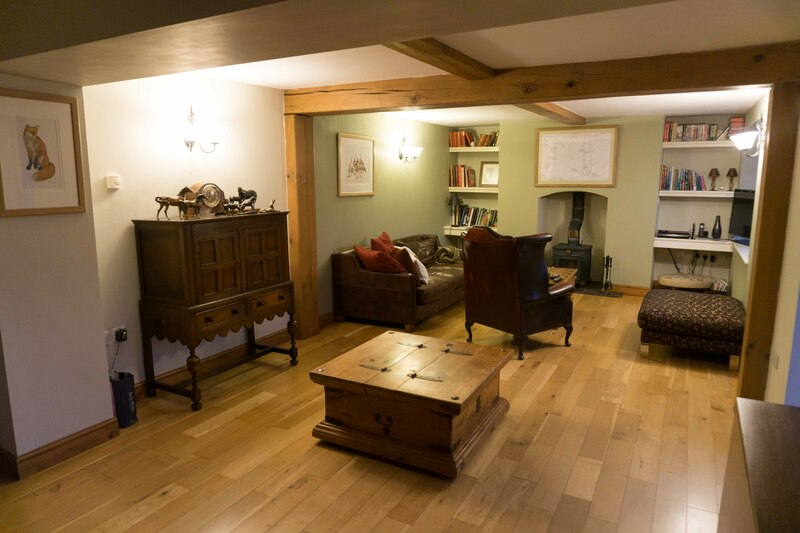 After taking the images of our area in the home upstairs, I think this area worked fairly well. It certainly could be used for a number of activities or for nothing and to be just left as an open area, or in this case an office. I took a number of images form various heights to give an overall impression of the space in question.